at the 2014 SLTNC during the Wauseon National M-C Races. 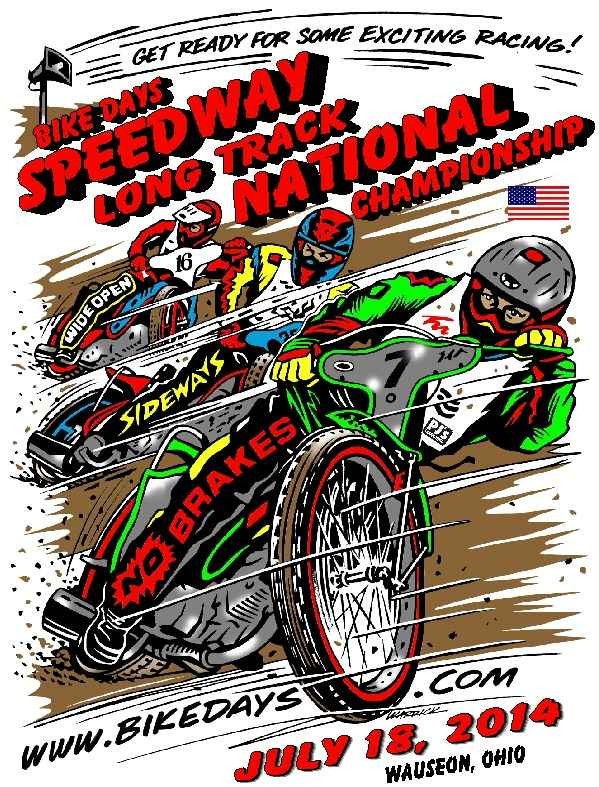 Greetings from Wauseon,Ohio--home of the 8th annual Classic Flat Track Half mile Races. First off, I’m thinking that Fulton County FairGrounds is going to have to enlarge their facilities, WHY? Because that place was filled to the Gills!!! If you plan on attending the 2015 races, make sure you get there early! Just remember, it’s the 3rd Friday in July. Chalk up another fine Day at the Races. Low 90’s, No Rain, and Blue Skies all day long. You know what that means—Outstanding Racing!!! As per usual, the Scott Brown Family and Friends- aka (Bike Days M/C) had everything under control. The 1/2 Mile looked positively Gorgeous, groomed to perfection and just waiting for some Action--and Action it did see! 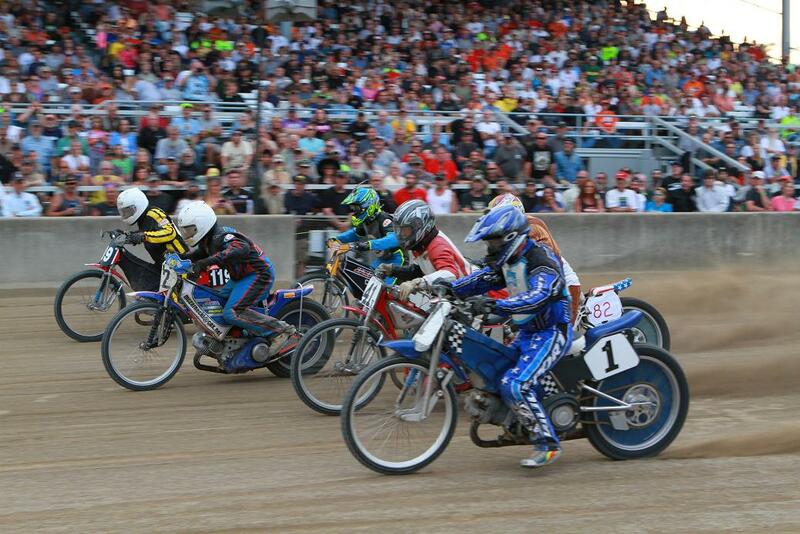 The Speedway Long Track National Championship began with a pretty good assembly of Speedway Riders. One up from last year, 11 riders this year. Same program as previous years—1.Practice---2.Heats—1.LCQ—plus the ‘ BIG' Daddies—the A and B Mains. Lots of time on the track if you wanna race Speedway on the 1/2. Hopefully in 2015 we can boost that # of riders to reach the level it was only a few short years ago. 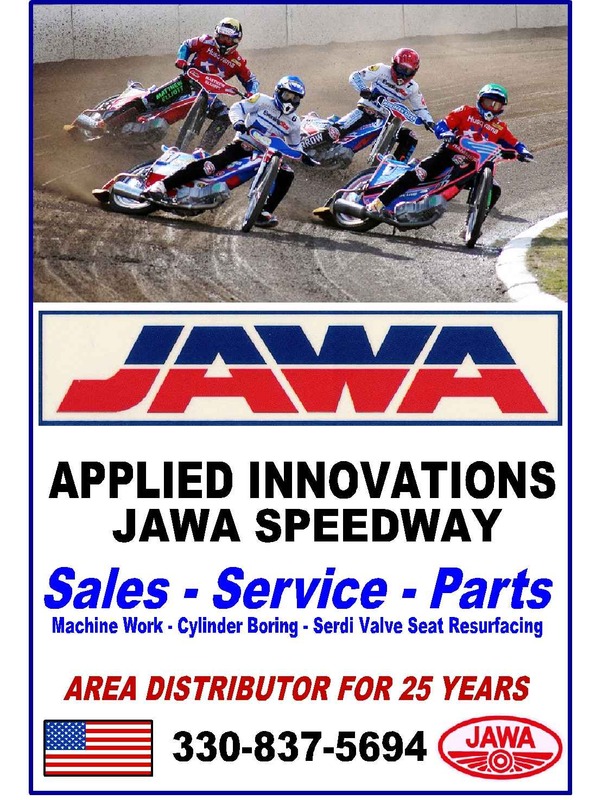 Everything looked great going into the A&B Mains, with no major problems or get off’s on the Speedway Machines. The A-Main was shaping up to be a real Rock em' Sock em’ winner take all fiasco. Danny Weicht(#1.) was going for his 4th year as #1. 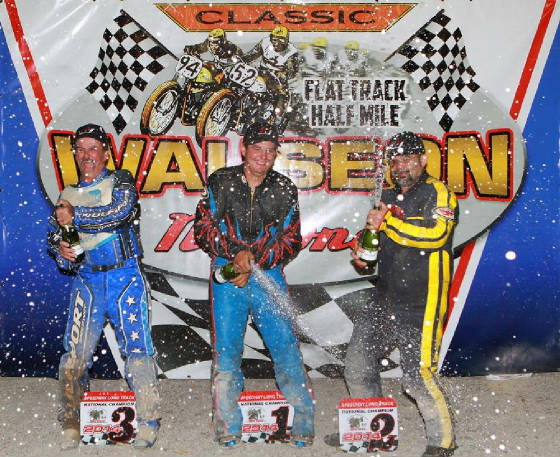 Chad Rall(#52) showed up this year on speedway, and was on a beautiful short stroke just recently purchased a few days prior to the Wauseon race from 2 time Canadian Champion Mike Hammond. John Debats(#41x) had just built a super fine Long Track Jawa to Rock N’ Roll. Needless to say, the rest of the field that made up the A-Main was just as anxious to get things rolling and give it their all and maybe come up with the elusive Speedway Long Track Championship. The A-Main blasted off without a hitch with everyone riding out of their Skin! An Even Steven start going into the 1st turn. Alan Rush(#119) made it into the clear out of the 1st corner bunching and had the hole-shot with the lead—but only momentarily, as WAM BAM---Chad Rall just stole Alan’s line through the middle of the 1st turn on the high line. This is where Chad stayed the whole 4 short furious speedway laps. Watching Chad ride that Fence line was like the ole’ days when Bruce Penhall used to hug the boards. Up there if you dare, is where the dirt is like the virgin snow—smooth and unmolested. Only one problem, make the wrong move and you’ll be dodging hay bales and kissing the fence goodbye! Chad pulled it off tho’, and took all the Glory!!! Alan Rush(#119) took the runner up position—Way To Go Alan--You’re flying out there! John Debats(41x) and Danny Weicht(#1) battled for 3 laps with Danny taking the 3rd spot after John Debats held it for 3 laps. Chris Hathaway(#82) and Brian(good 2C you at Wauseon)—#4 brought up the rear respectively. Note to self: next year i hope some of the riders invest in a Full Face helmet, because those little lime stones can really reek havoc with you! The B-Main Event was held at the line for a little while longer than most of the riders expected. Mike Callen(#33e) and Michael DeChamplain(#63) jumped the start, and the race had to be restarted. In case you've ever wondered why the speedway motorcycles roll their machines over on the right side before the start--it’s to cool the clutch. Jon Massie(#77) had clutch overheating and he elected to do a running start set on the 2nd line along with DeChamplain and Callen. Finally, off we went, DeChamplain’s clutch fried and locked, i wasn’t going anywhere except to push the motorcycle down to the pole so the race wouldn’t be shut down for a 3rd time. Jon Massie, despite being on the 2nd line and doing a drop and haul start, managed to surprise and overtake John Busler(#6) coming out of turn 2. Jon told me later that he made up his mind he was going for all the gusto—and that he did!!! 1st place in the B- Main is pretty darn good considering he hasn’t ridden in awhile. I have an ole’ saying—“If it doesn’t Rain, My Bike Starts and nobody gets Hurt, it’s a great Day”. Wauseon this year was all of that and a Helluva Lot More. 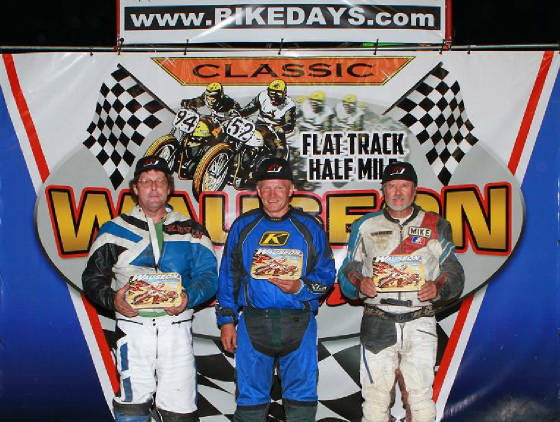 Excellent racing throughout the classes and one Wild 'ROMP' Match Race with Jay Springsteen and George Roeder. How can you go wrong with an event like this!!! Show up in 2015 and be a part of this Wonderful event. *** One final note: This years 'Hat’s Off Riddler Award' goes out to my friend John Debats(#41X). John busted his crank to get that 'ground up Long Track Jawa' on the track for the race only to find out that the motor was shot with only 12 hrs. before the opening of the gates at Wauseon. He then took his brand Spankin’ new 884 Jawa motor that was on his Mantle at home as a display and popped it into the Long Track frame. Most people would not think this is a Big Deal!!! WRONG—it was the last Upright Motor to leave the Jawa Plant in Czechoslovakia. after being bridesmade 3 times and placing third twice. Alan Rush finished an impressive 2nd, with reigning champ Dan Wiecht making it to the box with third. Mike Callen finished 2nd, and Kevin Sexton took third. 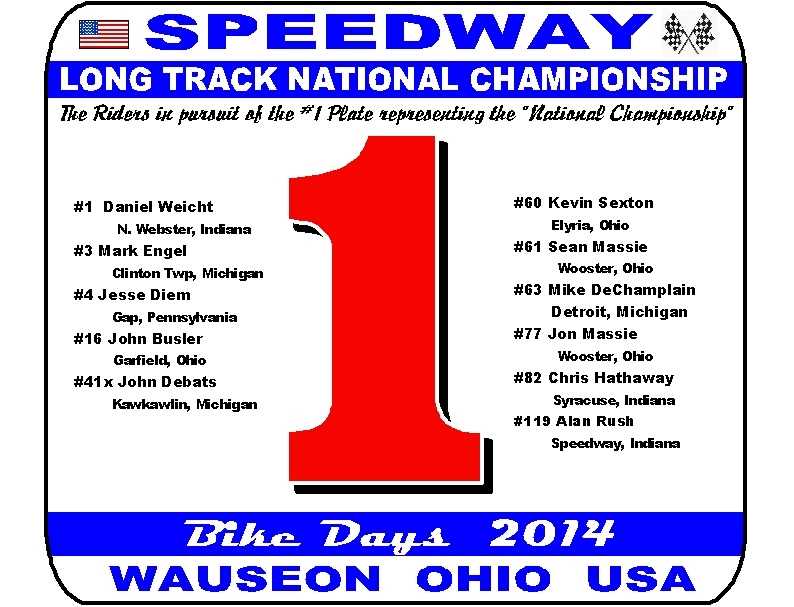 Riders pre-registered for the Speedway Long Track National Championship as of June 2014.